I couldn’t make a long story short to save my life, but I’m great at making short stories long. I recently had an issue with Rumparooz PUL delamination, and I wanted to share my experience with you, in case you have Rumparooz, or had heard anything about this issue. 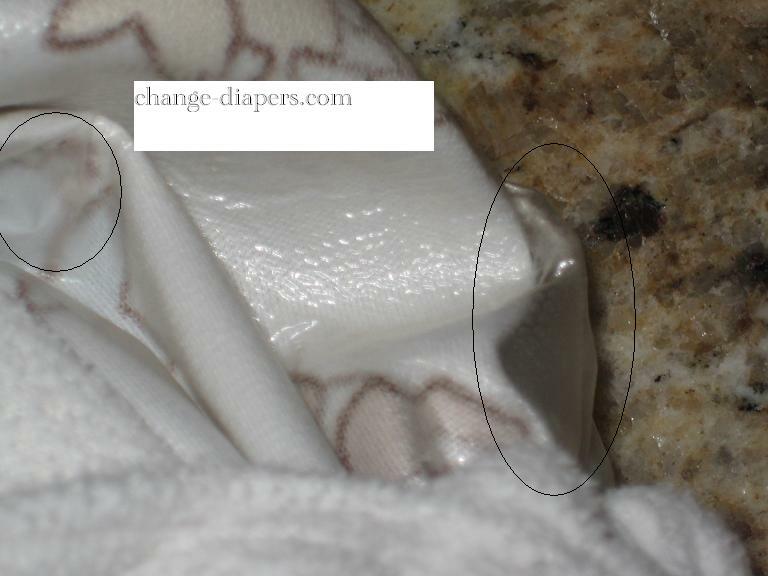 Let me very clearly state: While the delamination problem is a known issue, it is a small portion of the diapers that are affected. If you are not having problems with your diaper. Good. Don’t worry about it. If you are having a problem, contact Rumparooz. I have been using Tide (which Rumparooz and a few other manufacturers recommend, but many do not.) I typically hang my shells to dry, but occasionally throw them in the dryer on low for the last 20 or so minutes with the inserts. 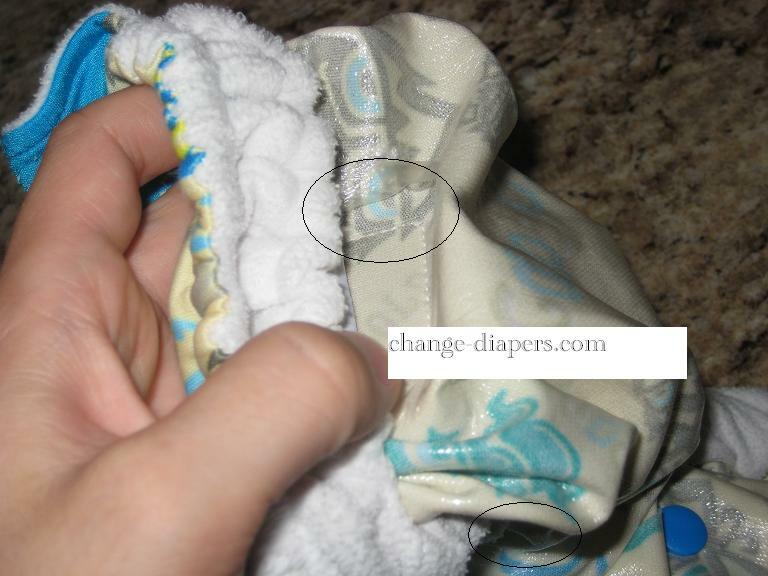 Saturday, I took my diapers down, and a few were a bit damp on the inside, so I turned them inside out. This was totally by chance, since I don’t normally do that. I immediately noticed “bubbles” where the water resistant PUL lining had pulled away from the outer. I checked the other Rumparooz I have, and that was the same way, but had actually torn free in some places. Here are some photos, I know I have mad MS Paint skills, don’t be jealous, LOL. Rather hard to see in photos, sorry. I sent an email from their website around 11 P.M. on Saturday and I had a response by 3 P.M on Sunday! Sunday! I received a polite response acknowledging the issue, with instructions on how to receive replacements. I thought that was great. In fact, I was ticked off, complaining, and wasn’t sure I should even bother contacting them…but after a few other moms in an online cloth diapering group had a similar problem, I thought I’d try. Since they will not allow me to actually post their explanation of what went wrong, what was affected, how they have fixed the problem, how to know if your diapers are affected and so forth, I will paraphrase. They know of a delamination problem with some diapers. It wasn’t all diapers, but they aren’t able to pinpoint which ones it was, until the problem arises with an individual diaper. It usually shows up after tumble drying. They have a new PUL supplier and do not expect this to be an issue again. Some of the affected diapers are still out there. If you have a problem with your diaper, contact them. Obviously, if you do not have a problem, you don’t need to contact them. In addition to the claim form, there were instructions on how to complete it, take photos and send it along with my receipts. Once submitted, I immediately received an auto-reply explaining that they would send my replacement diapers within 48 business hours. Since then (4 days ago, as of the time this post is being published), I haven’t received any correspondence. No claim approval, no shipping notice. For any rotten folks out there, you have to contact them to receive the claim form, then send your receipt as well as photos that show the defect, with the completed claim form also visible in the picture. So no sneaky borrowing pictures to try to pull one over on them! My reason for sharing this with you is two-fold. One is that I was not happy with Rumparooz Saturday night. However, I am glad they are standing behind the product. It’s just a shame that all companies can’t be as up front as Rockin’ Green was with their recent recall. Not all companies are even this responsive to problems. I contacted Blueberry in January after my Minky Aplix diaper had one of the laundry tabs pretty much shred off of the diaper. Keep in mind I’d had this diaper less than two months when I sent the email, and the laundry tab had started coming off almost immediately. Thank you for your comments. Unfortunately Velcro is a beast. I prefer snaps myself, just due to the no maintenance aspect. We have tried many different varieties/brands of Velcro and have tested many different scenarios. Either we can have soft velcro that looses it stick or one like that is too stiff and will scratch the baby. We are always looking for way to build a better mouse trap. Thanks again and have a greta day!!! First off, I am so guilty of typos, especially reversing letters or leaving one out. However, receiving a typo-riddled response made me feel less than important. I also felt very brushed off. Like this was no surprise and no big deal to them that my THIRTY THREE DOLLAR diaper was a hunk-o-cr…junk. No request for more information or photos, nothing. I clearly explained that I’d had the diaper about a month and that the velcro was so “sticky” that it was nearly impossible to remove from the laundry tabs, and that one laundry tab had torn almost completely off. Needless to say, I haven’t been able to bring myself to buy any more of their diapers, even though I like the snap closure diaper I have. Yes, I spent $33 on a diaper. I’m appropriately ashamed. Isn’t it interesting that the 3 most expensive diapers I’ve bought are the 3 with the biggest problems? OK, the second reason I wanted to share this with you is to urge you to check your diapers. If you have a Rumparooz that you purchased in the past year or so, turn it inside out and look at it. If you have washed your diapers many times, occasionally tumble drying them and you do not have any problems, you do not need to contact Rumparooz, your diapers are fine! The worst of my delamination (the torn part) is in the back, but if it were in a wet zone, the diapers would likely be leaking. Thanks for the update! I have 1 rr and luckily don’t have this problem yet! I purchased RAR in march of 2010 six of the 12 started to delaminate in augustbof 2010 Contacted the customer services department: went through the process of taking pictures shipping items etc. I asked the representative if they needed me to send in the other six since they came from the same batch, she assured me that if it ever became a problem just keep them when they delaminate contact them they have my info and on file and they will just make a note to replace those when and if I have to call back. Irecieved my new ones. I used some of the new replacement one but only for 5 months as my youngest became potty trained 15, months after I made my original purchase. So I stored them in a plastic in awaiting my next pregnancy. I pulled them out and as I’m building the diapers I notice the ones I never used and the ones that I used for 5months are already starting to delaminate I Called RAR and they said they won’t replace them because they are only puckering and not completed lifted yet. Im very frustrated will never purchase another cloth diaper from this company. I just noticed this happening to mine yesterday. I really expected more from RaR. The worst part of this is where I typed in “rumparooz” on google and “pul seperating” came up as my second choice. Contact them! This was a while ago for me (before my switch to wordpress, hence the funky spacing, LOL) but hopefully they will make it right!! >Honestly, that is super, super lame. This is a known issue that's happening repeatedly. Maybe some people don't want to buy their diapers again, jeez.I'm not sure why I feel bitter about people paying shipping for these, yet I'm considering paying to ship two Bumgenius in for coverage under the warranty. I would have gladly paid to ship my Blueberry diaper as well if they had offered to replace that (bad aplix)Maybe because the RaR was a known quality issue and not really a 1-year warranty issue. >I had some diapers from November 2009, I noticed delamination in May 2010. They sent me the form, I filled it out, and in less than a week I had two new dipes. One of the replacements just delaminated, and two more of the November ones have delaminated too. I contacted them and I got a reply within a couple days. I have just now sent in the pictures, so I will know in a few days how fast they are, but the steps this time are MUCH different from last time where I didn't have to ship the affected dipes back… Now it looks like I will have to pay to ship, and they will send me a $5 gift card to use on their website. I guess this is fine by me as I am pregnant again and will be using this dipes on my 2 yr old until she potty trains, then on the new babe when s/he comes in December/January. I see you have an update, so I will pop over there and read it. >I have a Blueberry Bamboo w/snaps and really like it (I just prefer a stay dry inner). I want to try one of their one-size deluxe w/snaps but I don't want to pay DOUBLE the price of other pocket diapers for it, especially not with all that, you know? >I'm glad I read this before I went ahead and bought Blueberry's! I had been thinking about it for a while, but if they aren't going to stand by their pricey product, then I'm not even going to give them a try. And I agree with you on the typo's! I make a lot of them myself, but when sending a professional email to anyone, I always double-check and spell check. It really says a lot about a company if they don't even bother to spell check their emails in my opinion. I'm currently going through a return process with Cotton Babies. So far it's going well. I hope it stays that way! >Wow, that is awesome! I recently had some contact w/FB that makes me love them too! Not diaper specific, just good people! >Ok this clears it up a little: PUL is a polyester fabric that has been laminated with a poly-urethane laminate using a solvent and chemical process. Biodegradable TPU is a polyester fabric that has been laminated with a thermoplastic polyurethane using a heat bonding process.Both a polyester fabric that has been laminated with polyurethane, just by different methods, hence the PUL vs TPU. Bleh. >They are *now* biodegradable, as they recently announced. PUL, TPU, tomato, tomahto, LOL. It was the waterproof feature and it separated. I'm in no mood to call all my other diapers toxic. They work without falling apart, and they're not disposables! I thought TPU was just a heat method for bonding the PUL and not a different material, but I dunno. >Thanks for the heads up! I just wanted to note that Rumparooz says their diapers are not made with PUL, but with biodegradable polyester and TPU, and say that PUL is toxic! >That is really stinky to have to pay shipping when it was clearly a defect. But I guess getting to keep the inserts makes up for it, huh? >I had a problem with my Tweedlebugs, too. The elastic broke after 3 times of wearing it (it actually broke in the dryer). I contacted the company and the next day I was contacted by a rep. I mailed them the diaper shell (I paid for shipping), and they mailed me back a new diaper. I also got to keep the inserts that came with the original diaper and they mailed inserts with the new diaper as well. They didn't pay me back shipping, but I got the new diaper the next week. I can't complain! >I had an issue with some Tweedlebugs one size diapers before my kiddos could even wear them. 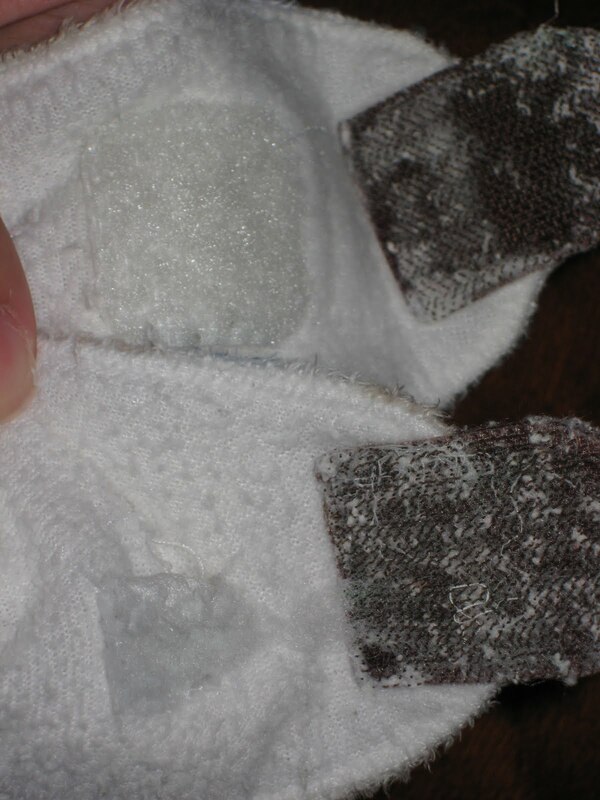 I had the same thing happen to all 5 (liner under snaps was fraying/shredding and there was a hole in one diaper on the seam. I sent my diapers in to be replaced (got to keep all the inserts, 10) and I am waiting for them to get a new shippment that no longer uses that fabric in them, they told me it will be another 2 weeks (it will be at least 4 total if they are sent in 2 weeks). I had to pay for my shipping costs too… hoping they do a little something to compensate me for not being able to use 5 brand new diapers! >The elastic went out in all 3 of my Smartipants diapers. I contacted the company in April about the problem. They asked me to email pictures with my address and they would send replacements immediately. I just received my replacements Monday, almost 4 months later. I sent several emails and was always assured they were being mailed that day. Last week, I sent them one final email. I told them I was going to publish a blog post I had written and share the link on their Facebook page. Apparently, that got their attention. Wonder if my timing was just right since they just made their big product announcements. I still haven't posted it, but I wonder if I should. >I hope your replacements are actually on their way to you. I have been having an issue with one of my Happy Heiny's and cannot get them to respond to me at all. So even though my other HH is fine, I will never buy another one. >customer service is a big pet peeve of mine, as well as e-mails with lots of typos. not that i'm perfect…but, it doesn't represent them well. both make me not want to even use my blueberry cover.good luck with the rar!